I am diving deep into rural culture of doing everything from scratch. 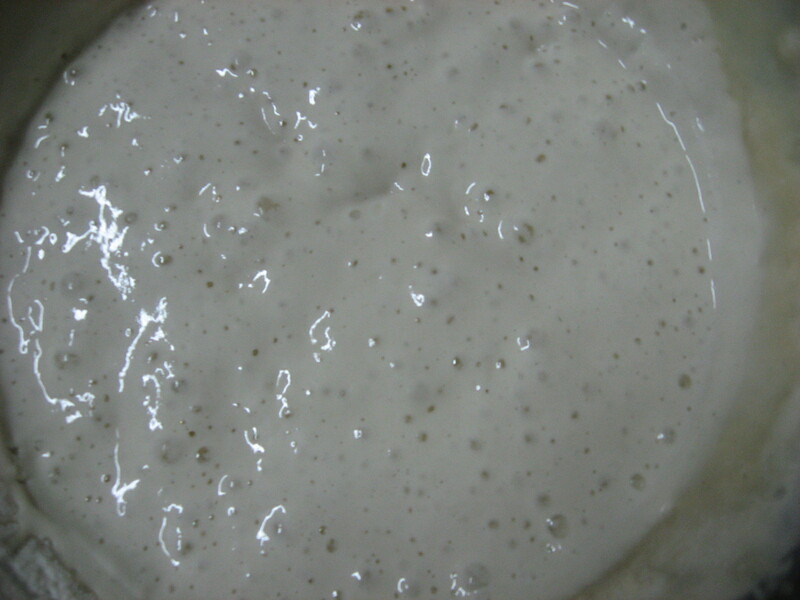 After the experience of baking pizza in my new wood fired oven, I took interest in wild yeast fermentation process, the .sourdough starter. Most of the time, my only door to the outside world is the internet. I researched all I could to learn the process. It is rather a very easy thing, just like soapmaking. I began with two different recipes, one that I followed more closely, and the other one that I ended up doing my way – both turned out OK. The first days, neither mixture would show anything except slight deterioration. The chef James Beard´s recipe called for flour, sugar, milk, water, and later on, a package of dry commercial yeast. As I had only instant dry yeast, I used compressed fresh yeast. The mixture never really bubbled, looking more like iogurt, even though it smelled like good beer . The other mixture I used just flour and water, and it looked flat, lifeless, until I decided to feed more flour. Then, it started to foam. Unlike others I have seen on the internet that make large bubbles, even on the bottom of the container, my was foamy only on top, but sticky all through..
After seven days or so, I prepared Beard´s recipe for sponge. It was strange to me that a sponge would take a lot more flour than the bread recipe, but I followed it. For the bread dough itself, he calls for a package of active dry yeast, which I didn´t have (I found only the instant one or the compressed kind in the store), so I was forced to use the instant yeast, as the compressed had green mold on it. It took a rise, a punch down, another rise, and then to shape it into a roll. I think my problem started at this point, as the end result was a flat, dense, slightly raw tasting bread, which endeed tasting deliciously tangy, with a dry thick crust on top and smushy bottom. First, I left the dough rise too long for the type of yeast after I shaped it. The dough opened on the top, showing some bubbles. Then, it suffered with low temperature oven, which instead of baking in 30 minutes, took over an hour. 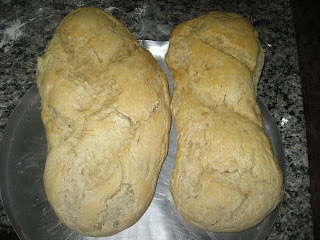 I was so dismayed that I would have gone to town to buy a good stove just to bake my other bread tomorrow. But tomorrow is holiday and all stores are closed. Meanwhile, the other dough is still left to rise. I am soon going to punch down and mold it into a free form and tomorrow, to see how it tastes. I am most curious about this one as it doesn´t have any commercial yeast, and the dough rose wonderfully. I am going to ask for my neighbors help to bake my bread in her wood fired oven. Or I will lose my hard worked dough. After all, for this one, it is going to be 10 days of watching, caring, kneading, and expecting.